A fun and inspiring family-friendly surf film night on Saturday, October 13 celebrates the local release Ojai filmmaker Elizabeth Pepin Silva’s latest surf documentary, “Introducing the Super Stoked Surf Mamas of Pleasure Point.” Afterwards, the filmmaker and some of the Surf Mamas will be on-hand to answer questions about how to stay fit during pregnancy and return to an active lifestyle once the baby is born. 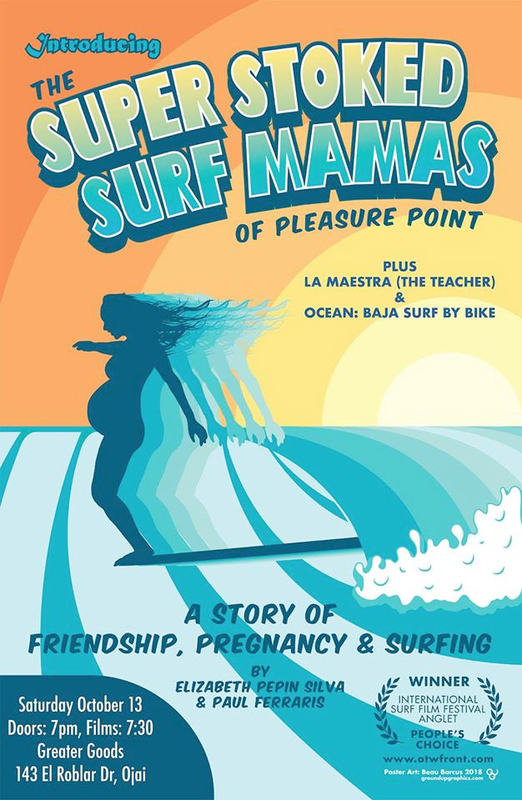 “Super Stoked Surf Mamas” (for short), a documentary film about friendship, community, pregnancy and surfing, features five Santa Cruz surf moms who support each other to continue surfing during pregnancy and after the birth of their children. The inspiring and delightful film recently had its world premiere at Europe’s largest surf film festival located in Anglet, France, where the film won the Audience Choice Award – an honor rarely given to a non-French film. Also screening is Pepin Silva’s 2015 award-winning film “La Maestra,” a short documentary about a young Mexican woman teacher who becomes the first woman from her town to surf will then be shown. Mayra Aguilar, the star of the film, is also one of the five women in “Super Stoked Surf Mamas,” which rounds out the evening. Some of the Santa Cruz Surf Mamas and filmmaker Elizabeth Pepin Silva will be in attendance to answer questions afterwards.